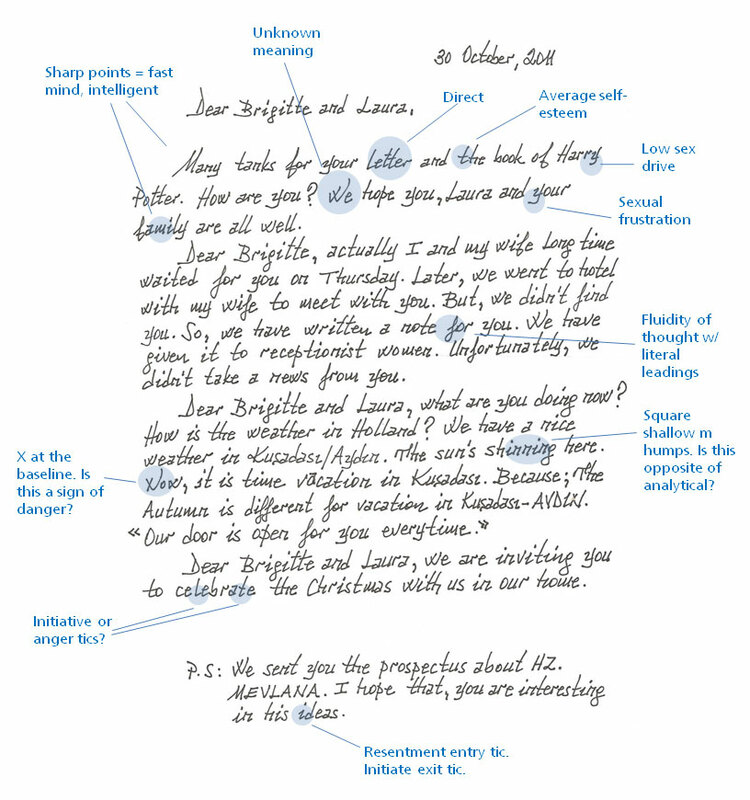 10 Traits in This Strange Handwriting from Europe – Handwriting University: Learn Handwriting Analysis and Graphology. Today I got a list of questions from a student of ours in Europe and I thought it would be fun to know and look at this handwriting with my readers but also give you some insight into how I would coach someone to become a better handwriting analyst or gain insight. 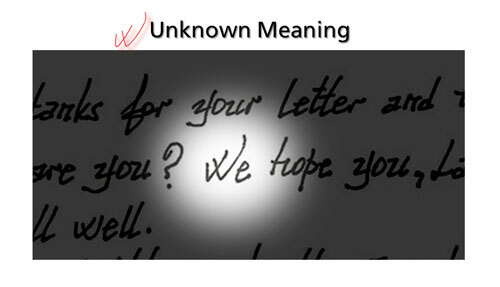 Quite frankly, our student Bruce did a very nice job on a very difficult handwriting sample. 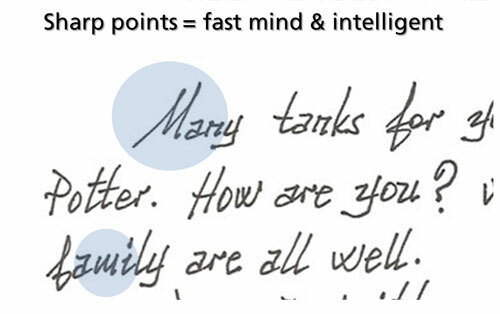 Since most of my handwriting samples in the home study course are from American writers, when we get students from Europe or India or Asia dealing with their own language, we see things and see fonts and styles which don’t necessarily have a precedent in the American version of the home study course. So I acknowledge Bruce on some of the challenges he came up with and I think he did a very good job overall. What I would suggest is you look at the handwriting before you read the full analysis or and answer these questions, just like Bruce did. Do you agree with what he observed and do you think that this person should be trusted or not? That really is the big question. As a handwriting analyst, especially if you’re going to be a professional handwriting analyst or a personal coach, you do want to be able to answer the hard questions. Can this person be trusted or are there any skeletons in their closet? That of course is a very big and subjective question which needs lots of data to answer and it’s possible you may come up with being inconclusive in that area. As a handwriting analyst, especially if you’re going to be a professional handwriting analyst or a personal coach, you do want to be able to answer the hard questions. Can this person be trusted or are there any skeletons in their closet? That of course is a very big and subjective question which needs lots of data to answer and it’s possible you may come up with being inconclusive in that area. I can sure spot some of the specific traits, just like you can, with even cursory knowledge such as what are they thinking, organizational ability, perfectionist, tendency to be dominant, great initiative, and some aggression. All these traits are very simple even if you have the basic course. It is often very difficult to ascertain something as subjective as ethics especially from a block printer or in this case a lower-case printer with not many connectors. So the first thing I’ll ask you to do is look at the handwriting sample without any notes and ask the following questions. Is this person a perfectionist? Does this person have a lot of pride or dignity? Would this person be dominant and pushy? Would this person have good analytical skills? Would this person be intelligent and be a quick, analytical thinker? And finally, could this person be angry or violent or have a snarky attitude or contain things like sarcasm or resentment? As you know, sometimes we find some of the most intelligent and critical minded people have a down side of being impatient and having a short fuse. So it’s not always good. Good traits do come with bad traits in many occasions. So before you go on and read the rest of this, take a minute and answer those questions and write on a sheet of paper. I would always suggest that when you learn, you print out a blank sheet of paper, you circle it, and you write the trait name out to the side. At the end of the article, I’ll show you mine where I wrote notes and then we mocked it up so you can look at it. This is a great way, almost like mind mapping, to analyze writing and you’ll become better and better if you begin to use this simple process. Click here to see the mind-mapping notes. Great, I’m glad you did that. Thank you for playing along with it. Now above is a list of questions that Bruce sent me. He said these are some of the things that I observed with some of the traits. Do you agree with his findings? This is a great way to learn, because the first step is to be able to see traits and then give it weight. How much accuracy is this trait? Am I doing it correctly? If I see a low-T bar, does that mean he has low self esteem? If I see a loop in the O, does that mean any secretiveness? Well, it all depends on how many T-bars we see and how many Os we see. So if you look at this list that Bruce provided, outside to the right, I’ve given you my answer; no, I don’t agree; yes, I agree; or inconclusive. Inconclusive means that maybe it’s there sometimes, but it’s not there. Maybe it’s there a little bit, but there’s a lot of other traits that offset it and so essentially it’s not that I disagree with his opinion, it’s that I’m not convinced. There’s enough evidence which tells me we probably shouldn’t mention it, it’s not confirmed, or it lacks the needed weight or number of times as it shows up. So basically you’ll see my notes on the right. And then finally, I’ve outlined some of my notes in a mind-mapping format which includes things like secretive, intelligence, and sexual frustration. There is one trait which I want to point out that is very interesting but I actually don’t have a perfect definition for it. I invite you to post on this blog if you have an opinion what this might mean. Perhaps you’ve read it in a book or perhaps you’ve seen it in your own culture. It is the Volkswagen W and I just made up that word, Volkswagen W, because if you look at the W in this handwriting sample, it is a capital W but it crosses over and creates an X just like the symbol of the Volkswagen car company. I don’t know if this was taught in Germany. I don’t know if it’s a symbol of perhaps a natural German handwritten W or if German schools teach it but of course, we do see it in the Volkswagen symbol and we see it here in this writing. Because I haven’t seen this before, a number of times I have no opinion on what this means and have no opinion whether it’s good or bad. Bruce’s concern was, is this a negative trait? Does it symbolize some dangerous intention? And the answer is, I don’t know, but maybe someone on our list does have an opinion on that. Also if you look to the lower left-hand side, we see the word “now,” it also has Xs in the N and in the W. Although I haven’t written about the X at the baseline, it’s fairly common in the graphology books when you see Xs show up at the baseline, that this is generally accepted as a negative quality. It is not a specific trait which means you can’t say, oh, the X means the person abuses dogs or the person is evil. But there does seem to be evidence that when people have Xs at the baseline, there is some sort of moral turpitude issue or there are some sort of dark thoughts and that’s all I can really tell you as evidence. Again, I invite you to share a link, share an article, share some samples of Xs at the baseline if you do believe that it always indicates something negative. And in this case, we do see the Xs of course, in the W and in the N and it’s primarily a printer with lots of analytical thinking and lots of tics at the baseline. Do you think this is all negative or do you think this is aggressive or do you think this is just a highly intelligent person? I’d love to hear your opinions on that. I would say that most of those tics could indicate little anger tics, little resentment tics, but also initiative. Sometimes they are very much cut from the same cloth. Finally, I want to tell you that even though we removed the signature for privacy reasons, this person is actually a doctor. He has a long name. It is a Dr. something something something and his last name was printed in all capitals. Very interesting. So this is definitely not an unintelligent person to have a doctorate in something and so we don’t have background on whether this is a person. Again this is a real question from a real certified student in Europe so we don’t have background on this individual and I don’t think there’s any evidence that this person has committed any horrible crimes. Do you think Bruce has anything to be concerned about? 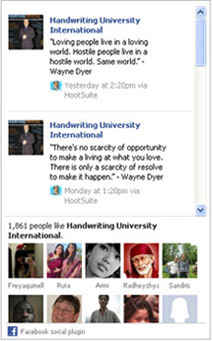 Please, put your comments at the bottom of the blog, make sure you log in, and we would love for you to contribute to the education on Handwriting University International. Low self-esteem – Bart: No, the writer has average self-esteem. Doesn’t have a big Ego – Bart: I disagree, vanity is a sign of ego, the writer has that. But you are correct, the signature was not large (signature removed from the handwriting sample for privacy). He is smart = comprehensive thinker – Bart: Yes. Investigative thinker – Bart: Yes & No. The M humps show analytical thinking, but the N humps are square shaped. So, inconclusive. Shallow thinker? – Bart: Yes. Attentive to details – Bart: Yes. Fluidity of thought – Bart: Yes. Organization ability – Bart: Yes, overall spacing & aesthetics tell us this. Honest or blunt – Bart: Probably. Pride & Dignity – Bart: Yes. Aggression ticks on the letter “i” – Bart: Yes. CD slant – Bart: Difficult to measure because of the lack of connected letters. However, I would agree with you. Physical frustration – Bart: Sometimes. Procrastination – Bart: Sometimes. The initiative reduces this trait. Some writing in Print – Bart: Disagree, most writing is in print (no connecting strokes). A bit Optimistic – Bart: Yes, shown in the slightly upward slant. Small writing – Bart: Average size. Desire for attention – Bart: Disagree. Locked down code of ethics – Bart: Inconclusive. Defiant – Bart: Probably, but I don’t see it in the letter K. Dominance could react in the same way. Is there anything else I’m missing? – Bart: See the transcript. Do you think this person has false intentions? – Bart: Inconclusive. Well I ask you this because I’m not sure, but I think he may have some skeletons somewhere in the closet. This person doesn’t want to reveal much about himself but has secrets and frustrations from the past. I wouldn’t feel comfortable with this person, would I be right?! Bart: The printing & secretiveness would create a tendency to hide his emotions. However, the CD Slant & blunt than would reduce this tendency. Would you like to have a one-on-one conversation with Bart Baggett about your life, dreams, business, or handwriting? Mr. Baggett meets with individuals weekly in his “business coaching” practice to help make strategic personal and business decisions. He also guides clients with important decisions involving business, money, and relationships. You can have him analyze your own handwriting, your spouses, or a friend’s writing as well as part of the new PRISM ASSESSMENT for business or personal coaching. If you want to become an ongoing coaching client, you can ask about monthly rates for one-on-one”coaching” when you speak with Mr. Baggett. 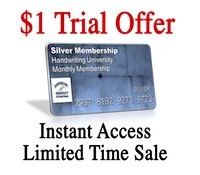 download the written application to get started. It’s a very interesting handwriting sample. Here’s what i observed in addition to what has already been analyzed by Bart and Bruce. The i’s in the sample contain perfect dots except in a couple of places where it looks like the dot is slashed down. So i think we can add loyalty to his attributes. The personal pronoun ‘I’ is a capital letter, so i think he doesn’t have low self esteem. The ‘h’ has a very square formation, so i think he has good coordination and manual dexterity. Maybe the ‘n’ humps are square due to this quality ? I am not sure whether we can conclude the writer is frank (due to the ‘o’) because he prints. The writer maybe intuitive as well. I think the writer is quite intelligent, can be trusted, and doesn’t have any negative qualities that cause alarm. This writing seems odd in the fact that there are so many sharp angles but it’s ultimately printed. The first thing that struck me viewing the sample in its entirety is how they all come together to produce a very floral, uniquely aesthetic, calligraphic look.It seems to me that writing like this would signify deliberateness, perfectionism, and a bit of pretentiousness. It just doesn’t flow, which would make me hesitant to trust his frankness, as if he were consciously molding his intentions rather than letting them be genuine. I am brand new in handwriting analysis so any input on these first impressions would be greatly appreciated! Thanks for posting such smart questions and insight. I think this is a great handwriting sample for our overseas readers to lend a hand or insight into non American handwriting. Most of our “home study course” and in-fact, most English language books on the topic utilize American samples throughout… this can be limiting to our students who live in India, Europe, or South Africa… .every country’s school system has slightly different ‘templates’ that they teach kids. While this doesn’t change the “result” of the analysis, it is often a challenge to the eye of the beginner analysts. If you live in Europe and have some insight on this handwriting sample or this unique type of hand-printing, please leave a comment. We are all learning together, worldwide. Re the crossed Vs to make W – my intuition suggests a fighting spirit – crossed swords etc. This might also support the resentment and anger tics indicated. Is he German, or from that vicinity of Europe? What sort of script did he learn as a child? (angular) Has he worked with cars? (VW logo) Might this also be telling? Is this Dr. Lecter? My impression of this handwriting is that the person is very tense. It is very angular, many letters form roughly 90 degree angles – that is tense, not flowing. What are Xs? Crossroads? Railroad warning signs? German Cross for sure. Interesting the way he writes his a’s. It is inscribed with a shield and causes him to walk through life with an invisible shield in front of him. It is a fear stroke, representing an attitude that prevents him from finding out how talented he really is. I believe the physical frustration is minimized because of the short descenders(lack of drive). and Hi Bart, thank you for a very interesting post. I will give my opinion on the unique “w”. 1. The “x” in the middle. “X” can be interpreted as the symbol of death, an end, or a target point (pirates always draw an “x” in the treasure map hehe…). In mathematics, “x” represents an unknown variable. In Christian religion, “X” is a symbol of Cross. Or, if you are movie lovers, you must know ‘The X-files’ haha … However, here is also something very interesting about X. If an illiterate person has to sign a document, he/she only needs to draw an X as his/her valid signature. So, X also represents self-recognition, self-authority and self-existence. – the X symbol is mostly found in ancient German, especially in the stone sculpture. This X is known as ‘gebo’. It is the symbol of partnership between two individuals. V itself is the letter of ‘value’. It is the letter that the writer uses to value himself and everything in this world. And this doctor’s second V is always higher than his first V. Why? 3. A ‘W’ is a ‘teacher letter’. It is a combination of two ‘U’s or sometimes two ‘V’s. The first ‘U’ on the left represents open mind, second ‘U’ on the right represents the desire to share the knowledge with everybody else. 2. The end tail of the second V is always high upward like he is reaching something upward. I think this means that knowledge is very important for him, he likes to study things, and he is intelligent. If positive, he has a very good value of himself and he also values people or things around him in his daily life. If negative, he is afraid of death. He also can be a very mysterious individual. 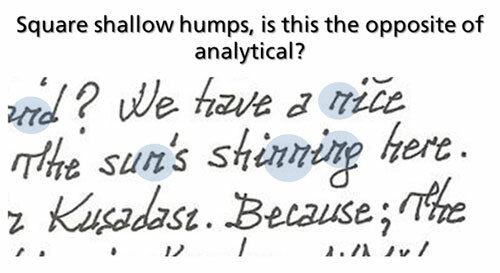 This is the best discussion about a handwriting sample I’ve seen all year. Keep the comments coming. Anyone from Europe want to chime in about the X or strange script? I lived in UK and studied Graphology under Renna Nezos. Though I think your system at Handwriting University is much more workable, I will pore over my European text books to see what might shed some light on that pesky W. I have been thinking about it ever since I saw it. My guess is that symbolism is at the heart of it. So many letters have blots…are blots and ticks called by the same name? 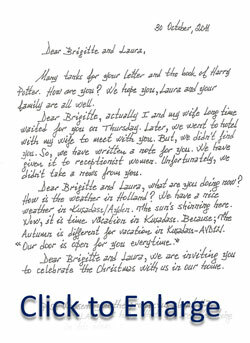 It must have taken a long time to write this letter! 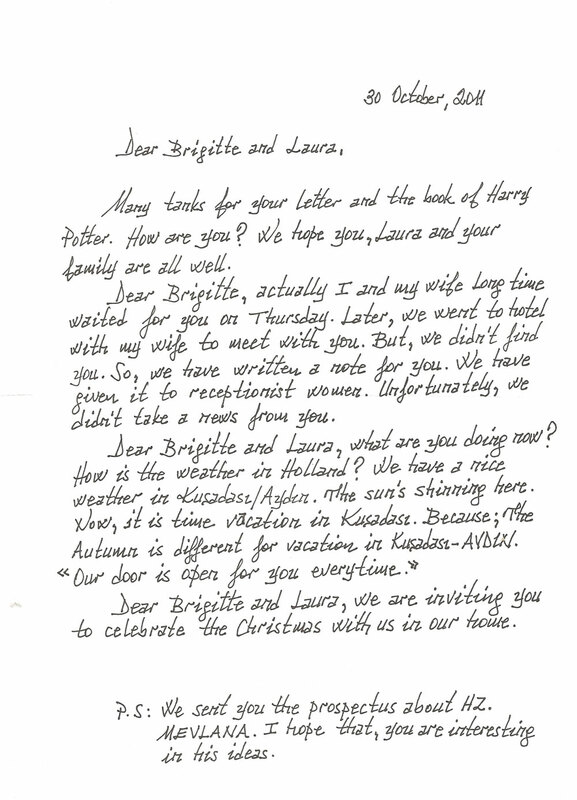 Due to the person addressed in areas of the letters with frustration ticks and sexual frustration y’s, I’d have to say he is interested in Bridgette and frustrated at having missed her several times. Also, the humps in the m’s change specifically at times when he is just mentioning facts. They are very analytical when he is addressing Bridgette or pondering if he will see her again and/or when, but they are formed with inverted humps when talking about the weather, which is a fact and requires no analysis. His anger ticks increase when he talks about the prospectus created by another male which may incidate he sees the other male as competition for Bridgettes attention. The double V W is of the 14th to 15th century blackletter type faces. This was called Textualis or textura or also Gothic bookhand. This w was part of their calligraphy. I believe this is either English and/or German. This was used in manuscript writing. An ex-boyfriend of mine refused to sign his name any other way but an “x” he could be very charming but had a very dark temper. and I think the crosses in the X and W are a sign of hostility.